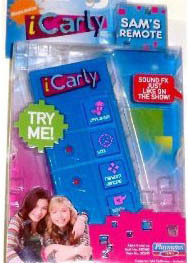 iCarly Sam's Remote produces sound effects just like on the iCarly show, including applause, boo's, sound bites, and even the famous random dancing announcement. You can use Sam's remote around your home, with your friends, or even when creating your own web show. All the sound effects are recorded on a chip on the device. Pushing the buttons activates the sounds.